It’s easy to get caught up in single-month dairy data. Hungry for fresh information, we look to the latest month to understand the trend. But the reality is that one month makes for a very small sample size, easily skewed by tactical or cyclical trading patterns, as I explain in USDEC’s new issue of Global Dairy Market Outlook, our publication analyzing the state of global dairy trade. 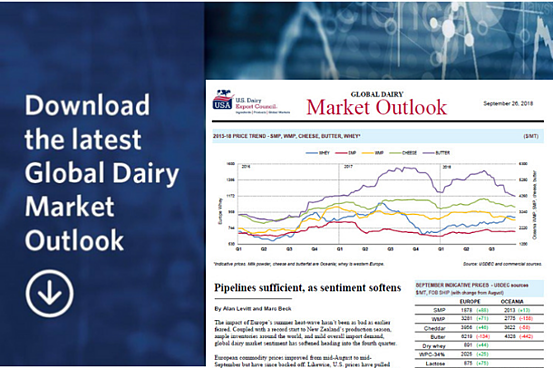 Click image below to download the latest Global Dairy Market Outlook. With global trade, for instance, the timing of Ramadan can push orders backward or forward in the Middle East region. Likewise, the Lunar New Year holidays in the Asian region. Commonly, traders buy ahead in a given month, for reasons that may relate to pricing trends, market sentiment or impending tariff changes, and then hold back the following month. Moreover, when comparing one month to the same month a year ago, the comparison can be distorted by what was happening last year. If that month was particularly strong in the prior year, for whatever reason, it may be difficult to post relative gains on top. While simple year-over-year comparisons for a single month can be useful, they remain imperfect. Because of the high seasonality of dairy production and trade, perhaps the most effective way of viewing trends is a 12-month rolling average. When graphed over time, a rolling average can show the current trend, and call out fresh changes in the trend direction. 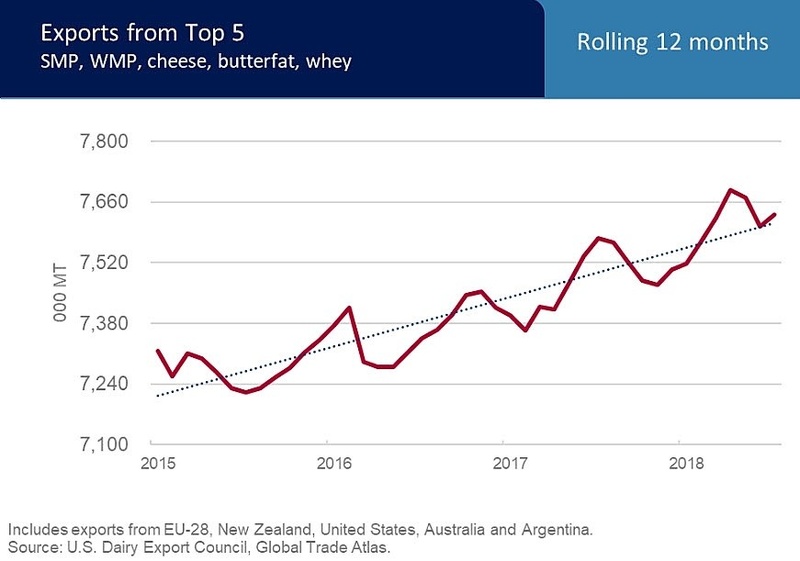 For instance, as a short-hand for tracking overall global dairy trade trends, we calculate exports of skim milk powder, whole milk powder, cheese, butterfat and whey products from the top five suppliers: the EU-28, New Zealand, United States, Australia and Argentina. These suppliers and these commodities make up the vast majority of world dairy trade. Plotted as a 12-month rolling average (see chart), the line shows a steady upward trend over time. But the form of the line is instructive: rather than a consistent profile, the increases are characterized by cyclical fits and starts. Over the last three years, the pattern has played out in a tactical buying cycle of about six months of good orders, followed by about three months of lighter orders. This recurring pattern, in fact, looks something like the repeating oscillation of a sine wave, according to USDEC’s new issue of Global Dairy Market Outlook. During the five-month stretch from last December to April, trade volumes increased by about 7 percent, led by a surge in buying from the Middle East/North Africa (MENA) region and, to a lesser extent, Southeast Asia, notes GDMO. In this case, commodity prices dropped last fall, bringing buyers off the sidelines to rebuild pipeline holdings that had waned in prior months. With robust trade in early 2018, markets tightened, and prices increased in the second quarter of this year. Meanwhile, buyers were more comfortably stocked up from their earlier buying spree. As a result, orders slowed in May and June. Orders recovered in July, returning to the long-term trend-line growth rate. If this pattern continues, we should see good orders over the next few months, before buyers pull back again—not necessarily because overall demand has slowed, but as part of their tactical, cyclical practices. Of course, this pattern will take place under a backdrop of record New Zealand milk production, resilient European supply and uncertain China demand. To read U.S. Dairy Export Council’s full outlook on dairy market drivers and U.S. performance, download the latest Global Dairy Market Outlook. Throughout GDMO, we display trade volumes and U.S. exports in 12-month rolling averages, as a way of quickly visualizing the trend.